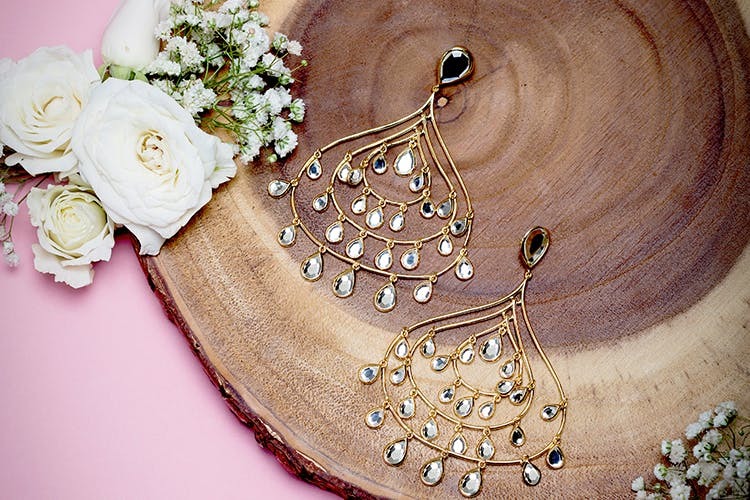 Isharya as a brand draws inspiration from India, but their collection has been loved and worn by celebs such as Halle Berry and Jennifer Lopez on the red carpet. So if you’re looking to make a statement, then they’ve got some intricate pieces that need to be added to your jewellery box. This jewellery brand does everything from earrings and bracelets to rings and necklaces, and are far from minimal. No wonder it’s been spotted on A-lister celebrities and international fashion icons, right from Selena Gomez, Kim Kardashian to Katrina Kaif, Priyanka Chopra and Alia Bhatt. You can pair up the Renaissance Rani Peach Translucent Resin Wave Hinged Bangle with an elegant LBD or style up your office attire with this Baroque Shine Lariat, which is pretty perfect if you’ve got a post-work party to go to. These pieces will add a little something to your OOTD and are more than enough to stand out on their own. Take your pick from iconic hand-cut polki mirror collections, bold silhouettes encrusted with semi-precious stones, hand-twisted intricate filigree or ones made with striking enamel and colourful resin. In addition to all core jewellery, they’ve also got fun little accessories like personalized clutches, customized necklaces and DIY chokers and bracelets. Their mirror-work and stonework pieces are stunning - the Bombay Deco Cascading Statement Mirror Choker, for example, has a way of making anyone look graceful. As exquisite as these chokers are, it’s their statement necklaces that stole our hearts. If you like your jewellery to be conventionally beautiful while standing out, Isharya might be the one for you. For those who love being the centre of attention, be a showstopper with their exotic looks. Season after season, they have been featured in magazines like Vogue, Elle, Harper’s Bazaar as well as on shows like Modern Family and Gossip Girl. You can either look them online or visit their new store to browse through their stunning pieces.